Leslie Uggams stars as Mama Rose. STORRS, Conn. – Just by stepping onstage as Mama Rose in “Gypsy,’’ Leslie Uggams is breaking significant ground: She’s an African-American actress playing a role traditionally taken by white performers, and a 71-year-old portraying a character usually presumed to be in her 40s or thereabouts. Uggams doesn’t settle for pioneer status, though. At the head of a fine multiracial cast at Connecticut Repertory Theatre, she delivers a fiercely committed performance in a rousing production of what many consider the greatest of all American musicals. What has elevated “Gypsy’’ to that stature, though, is not just the terrific score by Jule Styne (music) and Stephen Sondheim (lyrics), or the sharp-elbowed script by Arthur Laurents, but the tragedy at its heart. And that is a place this production is not especially willing to venture. Under the direction of Vincent J. Cardinal, this is a “Gypsy’’ that aims to please rather than unsettle, especially in the syrupy reconciliation between Rose and her daughter Louise, played at Connecticut Rep by Amandina Altomare. The lovey-dovey moment rings hollow, occurring as it does in the immediate aftermath of the harrowing “Rose’s Turn,’’ where Uggams’s Rose stands on an empty stage, lashes out at her children, and vents her bitterness at the way all her dreams have turned to ashes. True, there is ample precedent for Cardinal’s leave-’em-smiling-when-they-go approach. But why not challenge the Connecticut Rep audience by ending on a bleak, uncompromising note, like the 2008 Broadway revival that starred Patti LuPone and Laura Benanti? I’m guessing Uggams would have been up for that tough-minded approach, because during the rest of “Gypsy’’ she doesn’t seek to ingratiate herself or to soften Rose’s many rough edges. Her performance is true to all the contradictions of this mother-of-all-stage-mothers, who lugs her two daughters and their kitschy vaudeville act around the country during the 1920s and early 1930s. Given that countless male actors are allowed to play romantic leads well into senior citizenhood, it’s heartening to see an actress of Uggams’s age get a crack at this plum role – and to see how little her age matters once the show gets going. Her voice is strong, agile, and expressive in numbers like “Some People,’’ where she spits out Sondheim’s great line “Some people sit on their butts/Got the dream, yeah, but not the guts,’’ and “Small World,’’ her flirtatious duet with Herbie (a solid Scott Ripley), soon to become the act’s manager and Rose’s lover. 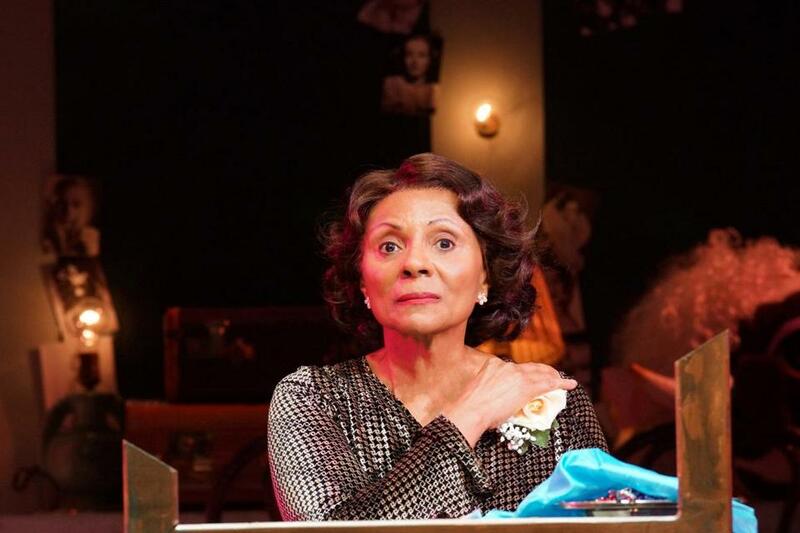 On opening night, Uggams muffed the first line of “Rose’s Turn,’’ but quickly recovered and delivered a rendition that had the raw power of an open wound. The racial diversity of this “Gypsy’’ is presented in a matter-of-fact way, which makes sense, given how prevalent nontraditional casting has become. There are no script changes or additions to explain why one of Rose’s daughters is white (Louise) and one is black (Alanna Saunders, who is excellent as June). Nothing is made of the fact that Rose and Herbie are involved in an interracial relationship. Racism is not adduced as a reason that Rose has trouble landing bookings for the family’s vaudeville act or an explanation for why her own showbiz dreams were stifled. There’s no doubting the fervor of those dreams. While Rose is operating in the waning days of vaudeville, her anything-for-fame attitude anticipates the ethos of reality TV. A crazed light shines in the eyes of Uggams’s Rose when she sings the Act 1 closer “Everything’s Coming Up Roses.’’ In that song, Rose is piling the pressure on hapless Louise because June – the mother’s longtime favorite, the one she was determined to make a star whose name would be “up in lights so big it will last our whole lives’’ -- has gotten married and fled. Much of Uggams’s performance takes place in her eyes. They flash one moment, when Rose comes up with a new idea for the family’s kitschy act, then turn ice-cold at the hint of a challenge to her authority or what Rose perceives as a betrayal. The actress communicates Rose’s genuine love for her daughters but also her willingness to use them as tools of her own ambition. There’s an unstoppable drive to Uggams’s Rose that goes hand-in-hand with a tendency toward heedless self-destruction. In Act 2, Altomare does an impressive job transitioning from plain tomboy to sultry knockout when Louise metamorphoses into Gypsy Rose Lee, ecdysiast extraordinare. Michael James Leslie is a forceful Pop, Rose’s sternly skeptical father. Luke Hamilton, as Tulsa, who wants to break out of the ensemble and start an act of his own, sings and dances up a storm in the showstopping “All I Need is the Girl.’’ Alas, the proficiency of the production’s singers and dancers was not matched on opening night by the band, which often sounded ragged.